Suriname, the former Dutch Guiana, has almost everywhere an equatorial climate, hot and humid throughout the year, with heavy rains, in fact it is covered with rainforests and mangroves. However, in most of the country there is a rainy season from December to mid-August (with a relative decrease in February and March and a peak in May and June) and a relatively dry season from late August to mid-November. In the capital, Paramaribo, located on the coast, an average of 2,200 mm (87 in) of rain falls each year; the rainiest months are May and June, when the rainfall reaches 300 mm (12 in) per month, and when it rains almost every day. Here is the average precipitation. The rainiest regions are the east, along the Maroni River, on the border with French Guyana, where the average precipitation reaches 2,500 millimeters (98 inches) per year, and the south-central, at the foot of the Wilhelmina mountains, whose highest point is Julianatop, 1,280 meters (4,199 feet) high, where the rainfall reaches 3,000 mm (118 in) per year. In the far south, in the Sipaliwini Savanna Nature Reserve, the dry season is longer, so the climate is tropical, and the region is covered by savannah, as the name suggests. Here the rainfall remains below 100 mm (4 in) per month from September to December, and just above this level in August, January and February. As mentioned, in Suriname it's hot all year round. 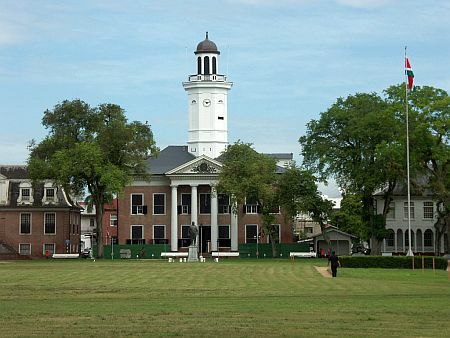 In Paramaribo, the average daily temperature ranges from 26 degrees Celsius (79 °F) in the coolest months (December to March) to 28 °C (82 °F) in the hottest months (September and October). Here are the average temperatures of Paramaribo. The sea in Suriname is warm all year round, and its temperature is similar to the average daily air temperature on the coast, oscillating between 26 °C (79 °F) and 28 °C (82 °F). The amount of sunshine is not so high from December to May, while it is good in the driest period, late August to mid-November. Suriname lies outside of the hurricane belt, in fact they pass over the Caribbean, hence, north of the country. The best time to visit Suriname runs from late August to mid-November, since it is the driest and sunniest; it is true that it is also the hottest, but here what matters most is to avoid the heavy rains. The short dry season, in February and March, is less pronounced, but it is still quite noticeable at least along the north coast, especially from Paramaribo to the west, that is, to the border with Guyana. However, for its brevity (one or two weeks) it's not reliable. In the far south, you can visit the Sipaliwini Savanna for a longer period, from August to February, with a preference for the period from September to December. Throughout the year: pack tropics-friendly, loose-fitting clothing, light shirts and pants of natural fibers (cotton, linen) or synthetics that breathe, maybe with long sleeves for mosquitoes; a light sweatshirt for the evening; a sun hat; an umbrella or light and breathable raincoat. From December to March, a sweatshirt for the evening.